Can Brown actually lose? Can Hogan really win? Above: Larry Hogan and Boyd Rutherford talk to reporters at Baltimore’s Inner Harbor on Monday. Can Anthony Brown actually lose this thing that was his to lose? 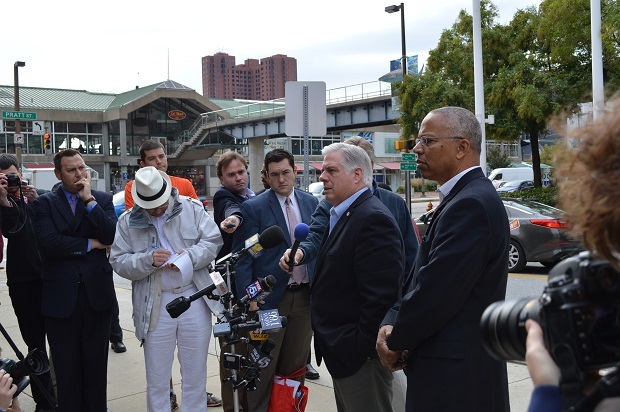 Can Larry Hogan really win? What was laughable to many six months ago, then became improbable, then possible, and now we don’t know. As one GOP official Sunday night said privately victory is so close they can almost touch it. The momentum seems to be in Hogan’s favor, and it has energized a Republican base used to having its hopes dash. But there are far fewer Republicans to be energized in Maryland than Democrats. Hogan has run a disciplined, single-minded campaign since January: grow jobs and the economy by cutting taxes and spending. Don’t distract the voters with social issues. “It’s just one message. It’s worked well,” he told reporters Monday. Hogan claims to be ahead in 20 out of 23 counties. “We think it will be tough fight in the larger counties,” he said, referring to Prince George’s, Montgomery and Howard. What we really don’t know in the final hours is the effectiveness of the Brown-Ulman ground game. How deeply have they adopted the technology and methods that allowed Barack Obama to beat Hillary Clinton in 2008 and Mitt Romney in 2012? This is a largely invisible effort that takes place in neighborhoods and streets, like the Brown-Ulman volunteer who came — with a tech device in hand — to a house on my street to talk to a regular Democratic voter and record her answers. UPDATE 11/4/2014 2 p.m. Just two illustrate the point, Two Brown-Ulman workers just showed up at the door at 10 a.m. on Election Day looking for a 31-year-old Democratic woman who hadn’t voted. She recently moved into D.C., they were told. The Brown campaigner made a note of that on her smartphone. They weren’t interested in the people who had already voted. Then there was the woman who called me yesterday so distraught with how things have become in her longtime home of Prince George’s County that she’s ready to leave the state. Will the sluggish state economy, the national mood, O’Malley fatigue, tax weariness, one-party rule or whatever be enough to overcome the natural advantages of the dominant Democrats in Maryland? We don’t know. The pundits and some pols have all decried the negativity of the Brown campaign, the candidate’s isolation, the blatant racial appeals, the lack of positive messages, the this, the that of the Brown operation. But in the end, will campaign manager Justin Schall have the last laugh as Brown wins by a close but comfortable margin? My pollster friend Patrick Gonzales thinks Hogan can win it by one percentage point, two or three at most. But David Lublin, political scientist and Democratic politician, has crunched the numbers, using the Gonzales polling, “analyzing the electorate from a racial prism because solid black turnout is critical to Anthony Brown’s chances.” Lublin shows how very, very difficult Hogan’s path to victory still is. On Tuesday morning, we just don’t know. Tonight we will find out. What if this close race is so close we don’t really know the outcome tonight? The recriminations will begin about the aging touch-screen machines that have been switching Republican votes and O’Malley’s failure to fund replacements that leave a paper trail that would make a real recount possible. We just don’t know. At last, we have some excitement and suspense in a dreary campaign. One of the safest Democratic strongholds in the state – Montgomery County – is being tested this election season as Republican nominee for governor Larry Hogan Jr. closes in on Lt. Gov. Anthony Brown for what once seemed like his easy elevation to the top job. Early voting tallies show Montgomery increased turnout by only a 1% compared to the 2010 gubernatorial election, and that is with roughly 60,000 more eligible voters added to the rolls. Montgomery is far below the statewide average of 8.3% and had the third lowest turnout in the state.